AP PhotoSan Diego Padres' Carlos Quentin flips his bat after striking out against the Seattle Mariners in the first inning on June 13 in Seattle. DETROIT -- Detroit Tigers manager Jim Leyland told reporters late Wednesday to arrive early the next day, acknowledging that "a whole bunch is going on." The Tigers announced a move Thursday morning, recalling Ryan Raburn and placing Drew Smyly on the 15-day disabled list. But could more moves be on the horizon? It appears the team will need to need to make at least one more move as Smyly was the tentative starter Saturday. To fill his spot, the team could activate Doug Fister from the disabled list. But, is that it? Maybe not. 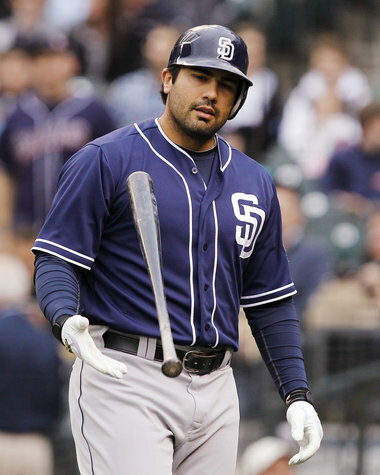 FOX Sports reported early Thursday that the Tigers are interested in trading for San Diego outfielder Carlos Quentin. The report comes less than a day after Tigers general manager Dave Dombrowski and Leyland met behind a closed door to Leyland's office. Were they talking about a potential swap-in-the-making? Or were they simply discussing Raburn's expected arrival? As The Detroit News' Tom Gage pointed out late Wednesday, there's little reason why Tigers officials wouldn't comment about a back-and-forth move with Toledo following Wednesday night's victory. That said, Quentin, 29, would seemingly provide an immediate impact to a sluggish Tigers' offense that could improve a DH spot currently ranked last in the American League in OPS (.604). The Blue Jays have also been linked to Quentin, and it's likely other teams will enter the mix as the July 31 non-waiver trade deadline approaches. Quentin is hitting .421 with a .542 on-base percentage and five home runs in 12 games this season after missing the first 49 games of the season while recovering from surgery on his right knee. Of course, the Tigers could be hesitant to bring Quentin on board due to a 2012 salary that exceeds $7 million. He is set to enter free agency at the end of this year and would likely be viewed simply as a second-half rental. His arrival would also create a logjam in the Tigers' outfield and at a designated-hitting spot that is currently filled by Delmon Young. Young has also been in the mix in left field with outfielder Andy Dirks, who is currently on the 15-day disabled list. With Brennan Boesch seated in right field and the return of Raburn, it appears the Tigers would need to reshuffle their outfield if they were to welcome Quentin.